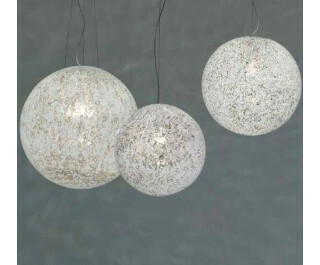 Inspired by the dandelion flower and using the traditional murrina technique that creates an organic light texture, RIna is available in five sizes that can be combined in a wide array of pendant, ceiling and wall lights. Vistosi's role in the world of interior design and furniture has been growing parallel to the good taste of architecture and design in the last two centuries. After collaborating with first-rate designers during the 1960s, the company has settled on the development of modular lighting systems, in order to create even more 'customised' installations: Giogali, Diadema and Ecos are the best examples of this new course. At the same time, the brand keeps on investing in the 2D and 3D models of its vast archive, as well as on its contract projects. Each of these conventions is followed by the Sales Department, whose task is to guarantee that the production and delivery schedule and the quality standards are respected. The core of this department is though represented by the Studio Tecnico: they lay out the big-size models and the custom lighting systems which are peculiar to each contract.